Offer your SMB customers the security of email backup and archiving with Office 365 Email Backup from Dropsuite. The highly automated off-site solution lets anyone start backing up their Office 365 emails without the need for IT knowledge. Emails, contacts, calendars and tasks can all be easily backed up and archived, then restored in just one click, giving your customers peace of mind that their data won’t be lost in the case of unexpected incidents. Office 365 Email Backup is an add-on to Microsoft Office 365 for Business, offering a very simple yet much more complete alternative to Office 365’s native solution. Offer your customers an easy-to-use email backup and archiving solution with one-click restore as an attractive add-on to Office 365. Backup and archive emails, contacts, calendar and tasks. 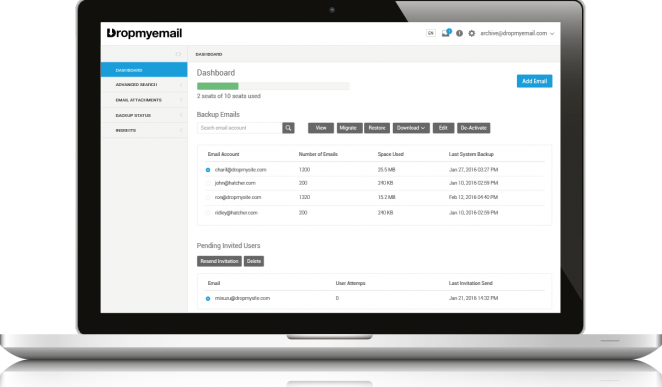 Quickly and easily restore and download your email data. With nearly every aspect automated, end users can start backing up their emails without the need for specialized IT knowledge. Offer email backup and archiving alongside Office 365 with no extra hassle. A proven opportunity to provide customers with insurance against data loss while increasing monthly revenue. Includes additional features including automatic journal mailbox provisioning and compliance rule handling, advance search and keyword alerts. Office 365 Email Backup from Dropsuite is a perfect add-on to Microsoft Office 365 for Business, offering protection against data loss that’s easy to set up and manage. The Office 365 Email Backup product sheet provides information about product benefits, features and pricing plans.